I heard a wonderful speaker at Concordia University Nebraska. Rev. James L. Brooks from Harmony Community Church in Chicago talked about the ministry opportunities and challenges in Lawndale, Illinois, home of Martin Luther King Jr. before he was killed. In the process of his talk, he reminded us of a psychological discovery of Martin Seligman known as learned helplessness. This discovery was found by accident when Dr. Seligman was studying depression. Because he was a well-trained Behaviorist, he conducted experiments on animals in order to better understand humans. In the experiments dogs were put in cages and subjected to mild electrical shocks. The dogs given a means of stopping the shocks soon learned to do this. At this outcome, the Behaviorists nodded their heads in agreement. But, the dogs that had no escape from the shocks, simply learned to sit down and suffer through it. Here the Behaviorists raised their eyebrows in disbelief. 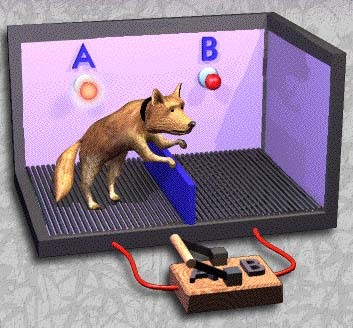 This phenomenon was called learned helplessness because the dogs learned to perceived an absence of control. Subsequent experiments with the helpless dogs showed that if they were moved to a cage that offered an option to stop the shocks, they would ignore that option and give in to learned helplessness. At this point the Behaviorists are stunned and confused. Learned helplessness is common in those who are depressed and people who are generally pessimistic about their abilities to control their situation are more prone to learned helplessness. Just like it does not make sense that the dogs would neglect to try things that would improve their situation regarding electric shocks; it is confusing to us when we see people who do not do anything to improve their lives. Their situations have taught them, correctly or not, that they are helpless. Helpless to prevent the violence; helpless to achieve in school; helpless to survive into adulthood. At this point, Rev, Brooks reminded us about the history of Lawndale. He reminded us of how the area was redlined, how housing prices were artificially raised and financial credit was denied. This situation, along with landlords happy to let their properties become slums as long as they were able to collect high rent from people denied financing to buy homes, created a situation that promoted learned helplessness. This environment then deteriorated as the strength found in families was threatened. The decline of family has left the area crime-ridden and the people without hope. In case we think that red-lining was an evil of the past, we should be reminded that in the last sub-prime loan crisis it has been found that banks purposely pushed minorities into sub-prime loans even when they qualified for prime loans. Whenever evil finds a way to profit; it thrives. Learned helplessness is the state we are in when it comes to our sin and salvation. We cannot get out from under the burden of our sin and the pain it causes us. We may try to fight our sin. We may try to deny it. We may even give in to our sin, thinking if we cannot stop it, we might as well enjoy it. However, the only real response is to relinquish any control we may think we have. and my pain is ever before me. When it comes to sin, learned helplessness is our best option. We must confess that we have no control over our sin or the pain it causes us. We must fall into the arms of Salvation. O my God, be not far from me! Just imagine what the Behaviorists would say to that? They would surely shake their head and turn and walk away. There is no good scientific theory to explain this reaction. As we learn about fellow brothers and sisters who live a life of pain and challenge, we need to remember about learned helplessness. We need to better understand why people who live in grief may not pull themselves up by their bootstraps. We need to remember that we have grown up in a world where we have frequently had help, good models, family support. We have rarely been redlined into a world of anything but our own sin. Just as it makes little sense to the world that we Christians would relinquish control of our sin and pain to take the hand of the One who offers Grace and Salvation. We need to stop expecting people who live in constant struggle to do what we expect. Instead, we should go to them, sit down with them, and offer the hand of grace and mercy even as it has been offered to us. Labels: Learned Helplessness; Salvation; Martin Luther King Jr.